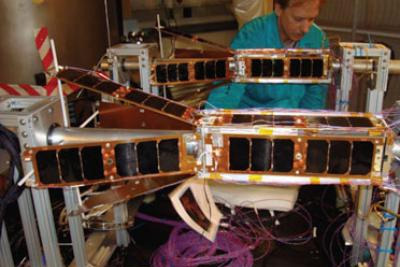 QbX (CubeSat Experiments) are nanosatellites in NRO's Colony-1 program to test technologies in orbit. NRO purchased 12 3-unit CubeSat busses with deployable solar panels and three-axis control from Pumpkin Inc. The NRO distributed the structures to other Defense Department or federal agency partners and universities to develop and integrate a variety of payloads. For the first two QbX satellites, flight software, antennas, and the TTC radio were built and integrated by the Naval Center for Space, as was the developmental communications payload. Environmental testing of the completed package was also performed at NRL. Ground stations on the east and west coasts provide coverage for command loads and data collection. They have sensors to measure the radiation, electron density, and ion composition of the space environment. They also have the ability to measure the charge on the spacecraft as it passes though the ionosphere. Spacecraft attitude is controlled by, and operates in, a novel "Space Dart" mode. Due to the low orbit (300 km) atmospheric drag provides a stabilization torque that, used with reaction wheels and torque coils, provides stable pointing to within five degrees of Nadir throughout the orbit. The system has been verified on both vehicles and is providing a stable platform for continued experimentation.